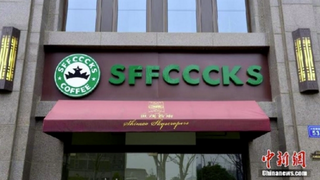 Shop at Appla and Drink Sffcccks Coffee on China's "Street of Fakes"
A cursory glance at this street in Wuxi, China would give the impression of a booming downtown marketplace that runneth over with only the hottest international brands. Look a little closer, and you'll notice that some of the spellings are a bit—er, off. Look even closer than that, and you'll realize that this bizarro strip mall is even more off-kilter than you could have ever known—all of the buildings' interiors are totally bone-bare. The real estate operators in charge are engaging in misleading behaviour and should stop this infringement.